Korea's President is now accused of recklessly sharing highly sensitive information with a buddy outside the government. Media has gone further (link) quoting insiders by name who claim Choi Sun-sil (최순실, sometimes rendered "Choi Soon-sil") was allowed to interject herself into Cabinet appointment decisionmaking, and "there aren't any issues where the President can decide on her own. It’s basically only possible once Choi has been asked about and approves everything." Of course, this lax system has horrible implications for state security, and warns against allied nation information sharing with South Korea's government. Choi's family is now virtually accused of witchcraft. A confidential cable to the US National Security Council from Deputy Chief of Mission Stanton in Seoul (via Manning & Wikileaks, link) labeled father Choi Tae-min a "Korean Rasputin" and "Rumors are rife that the late pastor had complete control over Park's body and soul during her formative years and that his children accumulated enormous wealth as a result." The elder sister Choi Soon-deuk and her daughter Chang Si-ho (alternately Jang Si-ho, Choi Sun-sil's niece) are implicated, as are other family members, who reportedly bankrolled Park Geun-hye's political launch. Sinister innuendo at highest level government! The wealthy Choi daughter, now 60, was tracked to Germany, where she gave an exclusive interview to Segye Ilbo (세계일보) a Unification Church newspaper. (Other media claim this interview "suggests fresh layers of entanglement" -- as the Unification Church or 'Moonies' are powerful & exceptionally controversial). Nothing's really new in this scandal however - the seeds have been germinating for decades. Now the Park administration is collapsing. Too much was built on corruption. 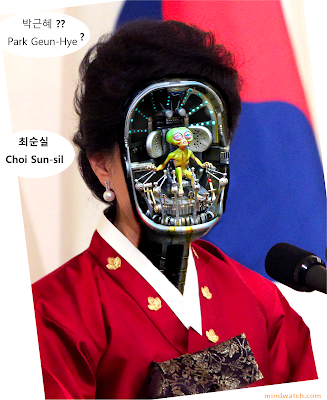 Most importantly, Park's management style is similar to the dictatorial pattern of her father. The Park administration's authoritarian & vindictive policies would not allow the great genius and industry of Korea to properly blossom -- instead, Korea's future is burdened by Hell Joseon. This recent Choi Sun-sil scandal should surprise nobody. Korea has allowed its top ranks to be stuffed with yes-men, who in turn have corrupted business, the universities, and government. Choi is now hiding overseas, leaving behind a damaged nation with an empty central park.